Cook and drain pasta as directed on pkg. Cut each chicken breast crosswise into three pieces. Heat oil in 10" skillet over medium-high heat. Brown chicken, onion and garlic in oil about 5 minutes, stirring occasionally. 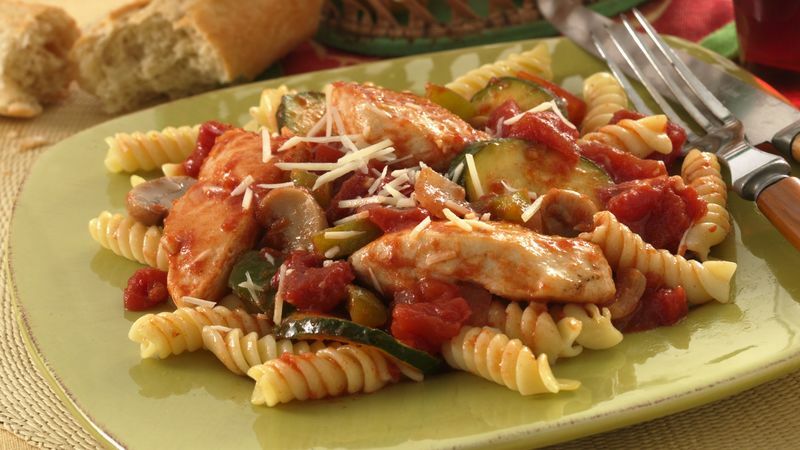 Stir zucchini, bell pepper and tomatoes into chicken. Heat to boiling; reduce heat. Cover and simmer 5 minutes. Uncover and simmer 5 minutes longer. Serve over pasta; sprinkle with cheese.